It's 6 January 2016...early in the morning. The sun has just risen, and we spent its rising with a lioness close to the Rooiputs waterhole in the Kalahari desert, more specifically, the Kgalagadi Transfrontier Park that straddles the borders of South Africa and Botswana. South Africa is experiencing a heat wave of sweaty proportions - normal summer temperatures here average around 45C, and this week it's been up to 54C most days...in the shade. As we drove out of camp it was already 26C, pre-dawn. Suddenly I spot a dark shape moving purposefully along the dry Nossob riverbed. 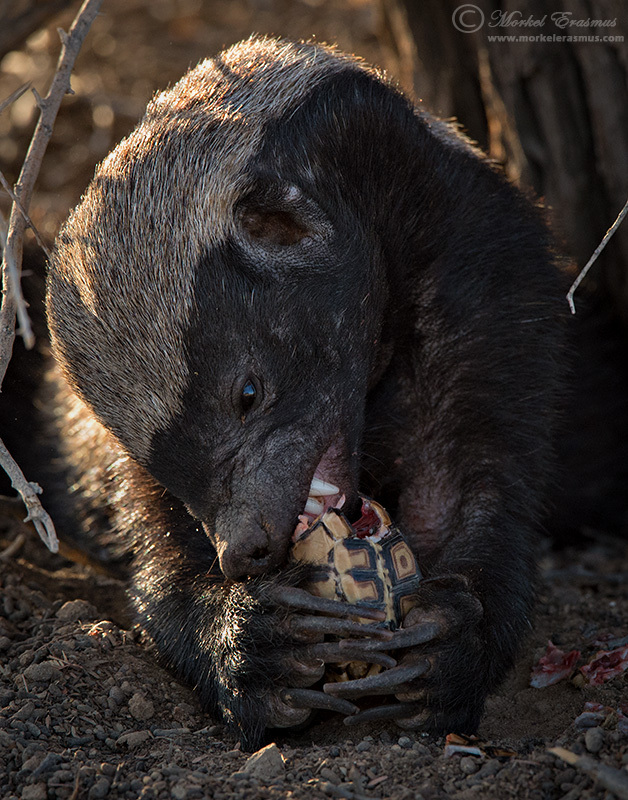 Honey Badger!! If you don't know what honey badgers are, they are pretty much the roughest, toughest buggers in the African bush. 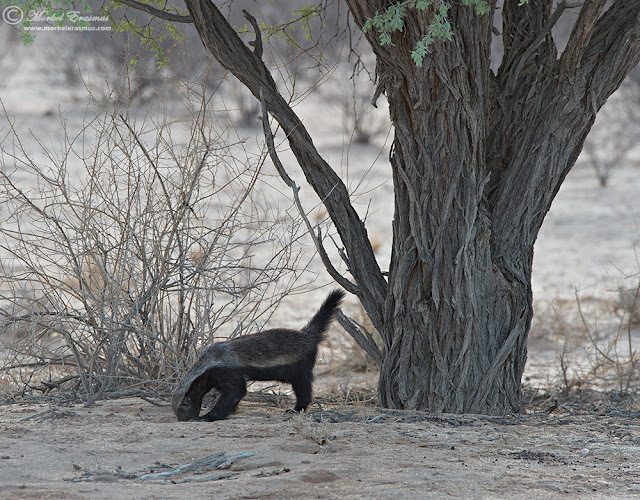 Anyhow, finding a honey badger on a trip to the Kalahari is a special treat, and this early in the morning! 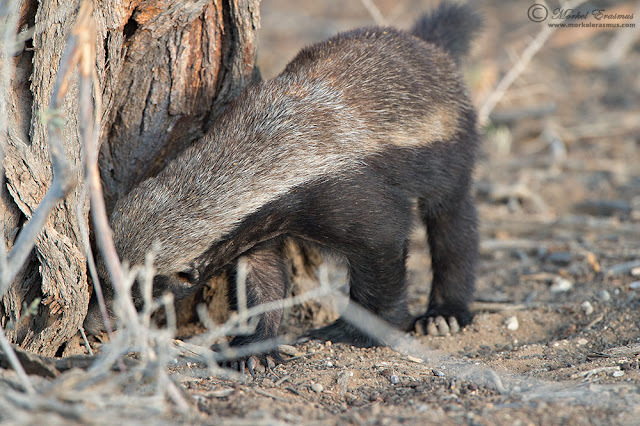 We follow him as he scrounges around, digging for grub in the loose Kalahari sand. "How about here? I smell something!" 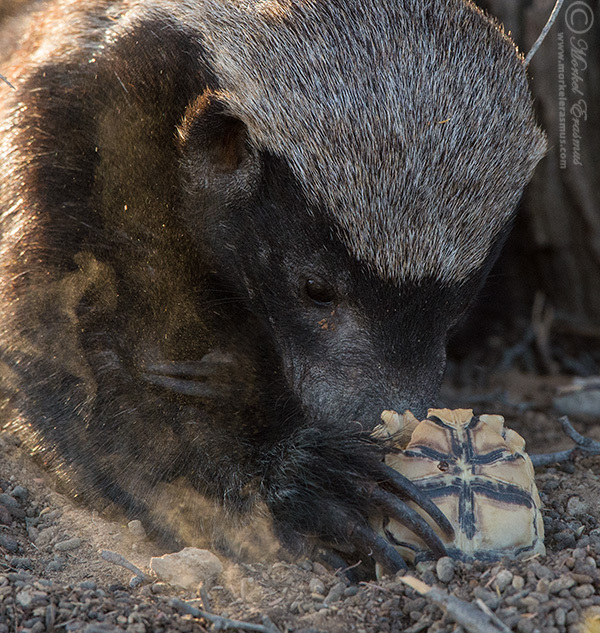 Promptly the badger dug up a small leopard tortoise! Right next to our vehicle (and we were the only people there). The prey in itself brought its own set of challenges - how to break through the shell? 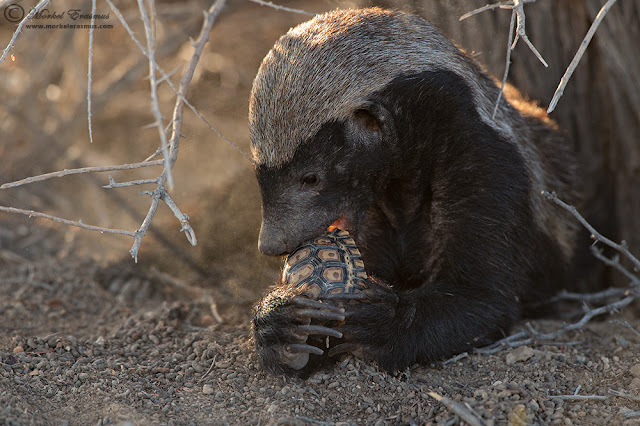 What followed is a lengthy process of the dexterous badger working his prey until he was able to pierce the shell of the tortoise, and get to the good stuff inside. Yes, it's sad for the tortoise, but it's the circle of life and it was fascinating to get to watch this "nutcracker" at work. 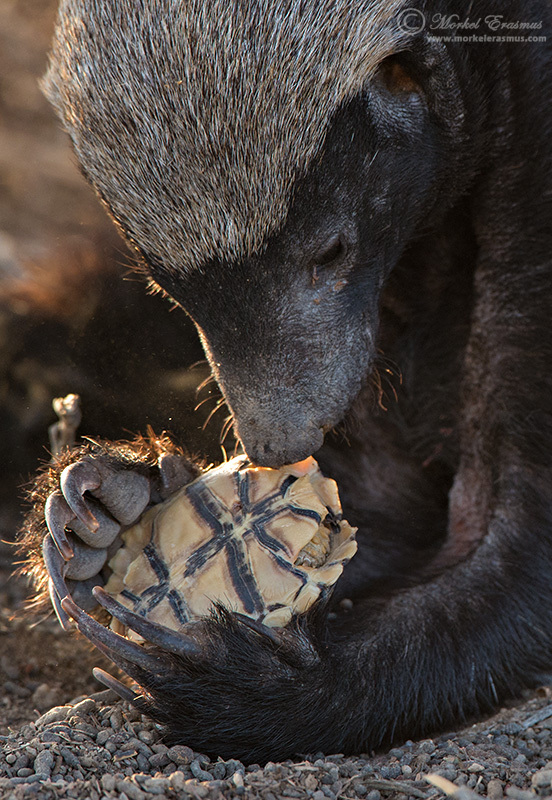 Suffice to say that the badger eventually got through the carapace of the tortoise. That wasn't the end of the morning's activity, though! 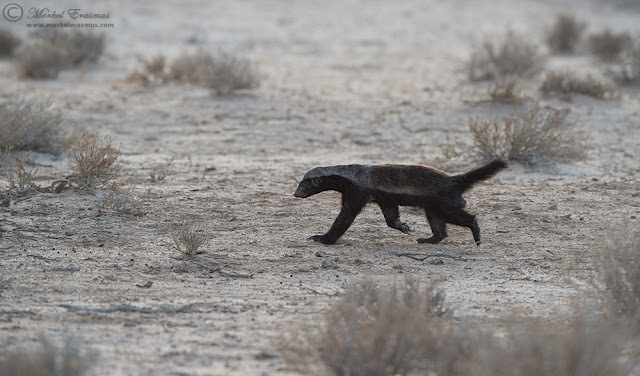 As we are watching the badger feeding, my wife notices that there are two lionesses and two lion cubs walking by behind the badger...talk about a Kalahari double whammy! 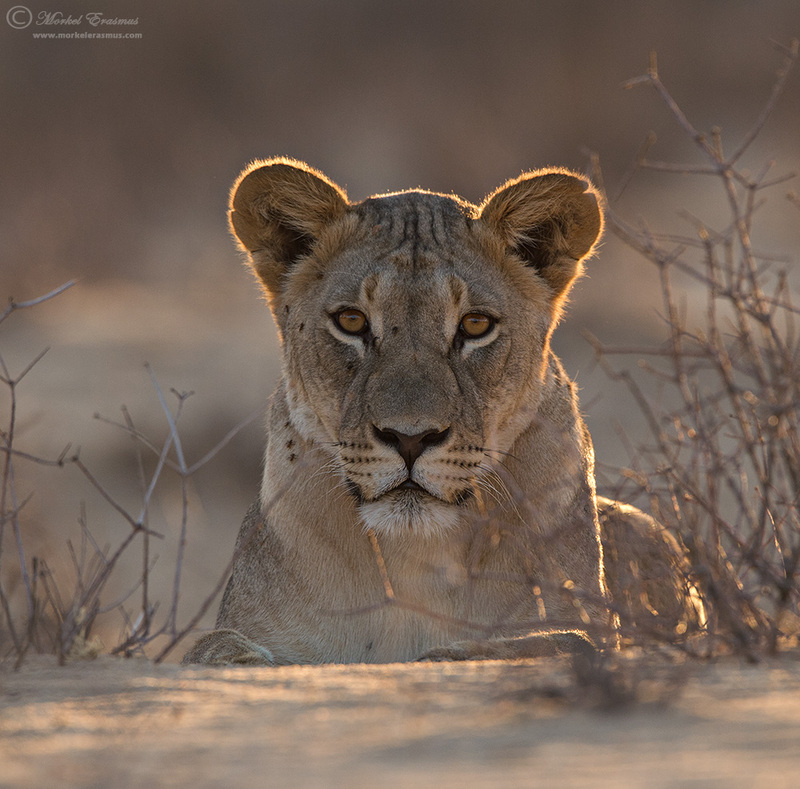 Let's leave the lions for another day - as they kept us busy for the rest of the morning. I hope you enjoyed seeing these photos! We have some video too - might edit and release it soon. 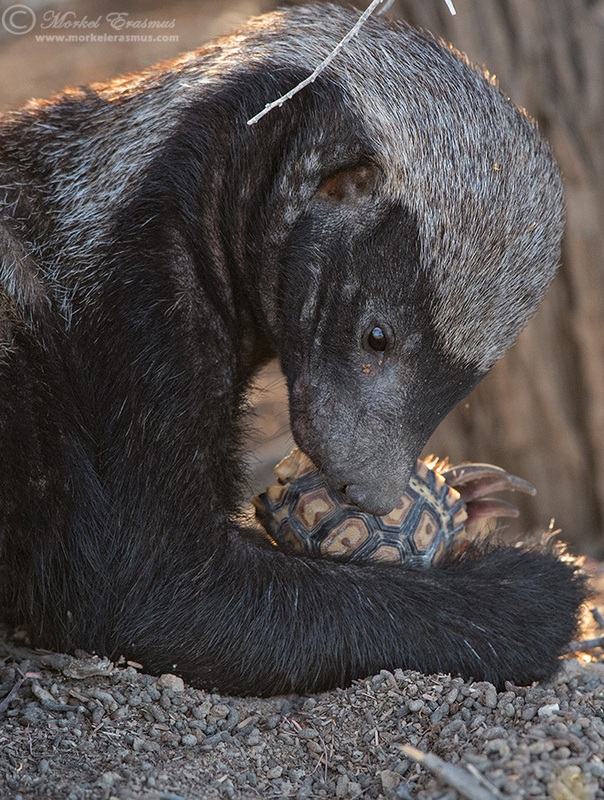 Thanks wonderful X you,wildlife photographers are heroes bringing it to us all.